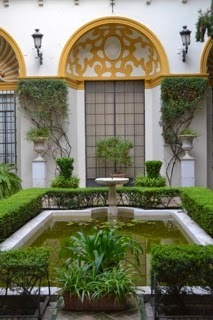 Seville is modern; it is steeped in history. 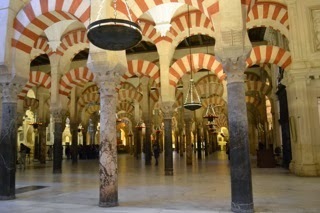 Seville’s soul is Catholic; it has a Moorish face. Seville is quiet; it is energetic. 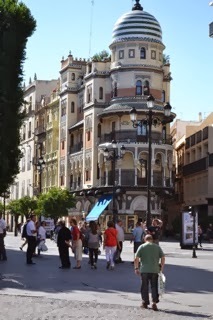 Seville is warm in climate; its people are warm and engaging. 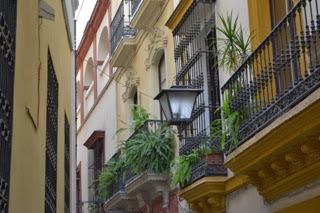 Seville is safe; it is charming. During the week the shopping areas are closed to most motor traffic so that pedestrians can easily view the stores on both sides of the wide streets. On Saturday afternoons the squares are filled with families, parents drinking wine or beer, children playing, everyone talking and laughing. The highlights of the city are its three World Heritage sites: its massive Gothic cathedral (full of gold and silver while the unfortunate beg outside), the Alcázar (a wonder—until we saw the Alhambra in Granada) and the General Archives of the Indies (which had a display of documents about the discovery of the Pacific). 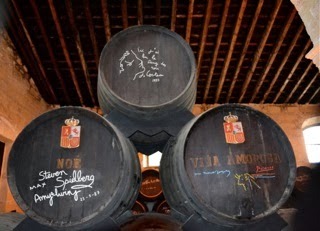 We had a tour of the Tio Pepe sherry plant, where kegs are signed by royalty and other famous personages who have visited the winery. It’s amazing how quickly a group of people on tour become fast friends after two glasses of free sherry. We also saw a demonstration of Andalusian horses at the Andalusian School for Equestrian Arts. Pictures are only allowed for a couple of minutes, so I don’t have a photo that’s good enough to share. The show, however, is spectacular! Horses dance in rhythm to the music, prance, skip, and jump into the air with all four feet off the ground. We heard you could enter the cathedral for free if you went to the early Mass. The fee for seniors in Spain is already a deal, as they extend it to all seniors, not just members of the EU (as in the other three countries we visited). “An extra Mass couldn’t hurt us,” we thought, and trudged across town, early in the morning. What a blessing! A youthful choir from the University of Rochester (England), in their red robes, sang from the sculpted choir seats in the center of the Cathedral, their angelic voices kissing our heads with their grace. The Mass was concelebrated by so many priests I never got a full count. There was enough incense to fog the altar from our view. Before, and after the Mass, all the priests chanted the Hours. I am always surprised at how often the universe sends us moments that touch our hearts and inspire us as we travel.